HEAVY DUTY INDUSTRIAL GRADE 1/8" THICK ALUMINUM DI-BOND SIGN. letrero Don't Settle for Cheap Plastic or Thin Gauged Metal. This Superior Material Will Outperform Them All. Use in Conjunction with Security or Video Surveillance Cameras. We only Manufacture Hi-Contrast Signs with select font choices, colors, letter stroke, artwork and backgrounds that will enable viewers to read message from the furthest distances with the most impact. Too many signs are overdone with artwork and messages can not be seen or read from a distance. Others will use a funky font, wrong color combinations, wrong outline color. Others are so simple that they generate no interest. All of these things and more will effect visibility and effectiveness. We know what will work for you. TELL PERPETRATORS, VANDALS, & TRESPASSERS TO BACK OFF FROM YOUR PROPERTY! Don't be a Victim. 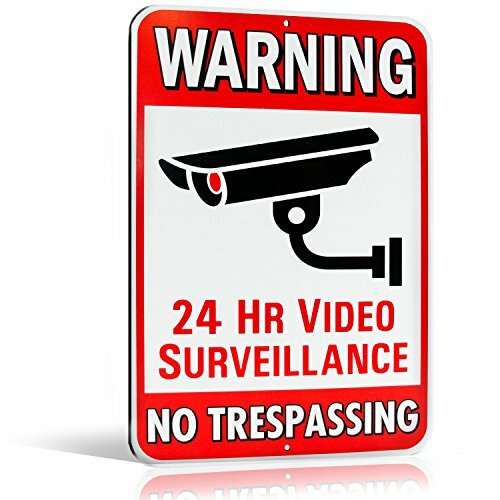 Protect Your Business & Home with this Aluminum Home Security Sign. HIGH VISIBILITY & CONTRAST. Made-In-The-USA.